Uday Jani, MD, became the 250th member of Beebe Healthcare’s 1916 Club when the integrative medicine physician joined in late March. Members are asked to donate $1,916 or more each year to help support the health system’s expanding programs and services. It was established as a leadership giving club to recognize Beebe’s 100th anniversary in 2016. Dr. Jani’s focus is treating the whole person – not just the disease. That is the basis that forms the foundation of Shore View Personalized Care, his internal medicine private practice in Milton. He earned a fellowship in integrative medicine at the University of Arizona – recognized as the leading program in the world for this specialty – and offers patients both conventional and alternative therapies to facilitate their body's healing response. 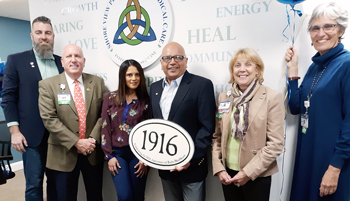 To further advance this effective, evidence-based approach to care, Dr. Jani requested his donation to the 1916 Club be directed toward expansion of integrative medicine offerings at Beebe Healthcare. Dr. Jani’s association with Beebe spans two decades, during which he served as chairman of the Mortality Review Community, chair of the Medical Department, and Director of Integrative Medicine. Today, he is an active member of Beebe Medical Staff. His family has also depended on Beebe, from obstetrics to orthopaedics. Dr. Jani said he shares that commitment with passion, inspired by a strong belief in the power of community to heal. “In integrative medicine, connection to community is considered as influential to wellness as a healthy body, mind, and spirit. I’m proud to support Beebe in its mission to prevent illness and restore optimal health to the community we all cherish,” he said. As a community-based, not-for-profit healthcare system, Beebe Healthcare depends on the generous support of individuals, corporations, businesses, and private foundations. All size gifts to Beebe Healthcare are welcome and are tax-deductible as allowed by law. Please consider joining Dr. Uday and Neepa Jani by making your leadership gift today. To make your donation or to learn more about the 1916 Club, go online to www.beebemedicalfoundation.org or contact the Beebe Medical Foundation at (302) 644-2900 or write to foundation@beebehealthcare.org. Photo caption: From left to right, Christian Hudson, Board Chair, Beebe Medical Foundation; Thomas J. Protack, Vice President of Development, Beebe Medical Foundation; Neepa Jani and Uday Jani, MD; Judy L. Aliquo, President & CEO, Beebe Medical Foundation; and Diane Barlow, Gift Planning Officer, Beebe Medical Foundation.